Discover the top attractions in Lisbon from a new perspective: aboard an exciting GoCar on a 90minute GPS tour! 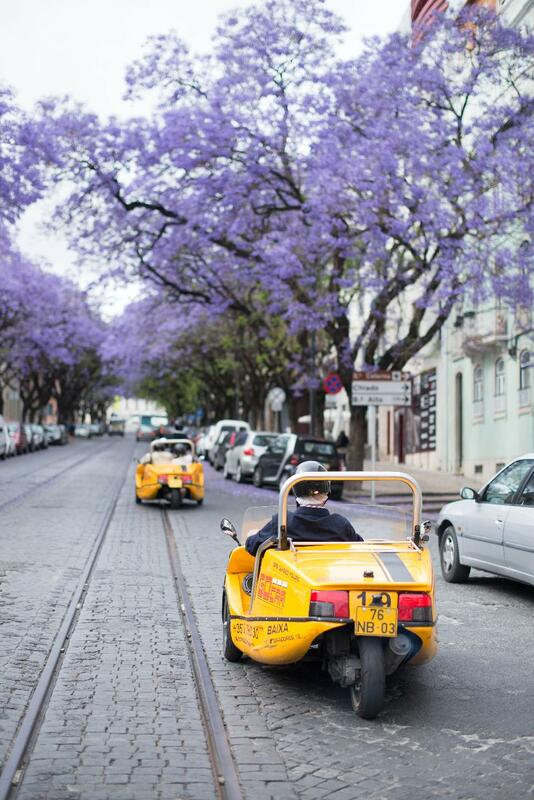 These yellow convertibles have an advanced navigational system that provides directions and friendly historical explanations so you can relax and enjoy an easy-going tour in Lisbon. Lisbon is an awarded European capital, some say it’s the coolest city in Europe and in fact we were blessed: geographically, meteorologically, even gastronomy-wise, and our history is rich in achievements! In the city center you’ll see the great harmony between tradition, historic heritage and modernity. In this tour you’ll be able to visit the most emblematic and cosmopolitan areas in the town (like Chiado and Príncipe Real) filled with charming buildings, antique shops, beautiful gardens, cozy squares, colorful mansions, museums and lots of people on the streets enjoying the city life. During this circuit you’ll be able to take awesome pictures (if you’re the driver, please don’t) of the Parliament, the National History Museum, Príncipe Real Garden, Restauradores Square, the gorgeous Rossio Train Station, among many other important landmarks. The cars have a personality of their own, helping in bringing the city to life in a fun and fact-packed experience. Welcome to the heart of the city where Lisbon is more vibrant. Cais do Sodré: The city's coolest district, a hub of great clubs, bars, restaurants and Lisbon's biggest food market, the lively Mercado da Ribeira. Santos: A neighborhood increasingly viewed as Lisbon's design district, where you can find IADE, a reference in teaching Creativity and also considered as one of the best Design Universities in Europe. Assembly of the Republic: The parliament of the Portuguese Republic that occupies the former Benedictine monastery of São Bento da Saúde, a truly beautiful building. Príncipe Real: The charming neighborhood filled with gardens, peaceful squares, antique shops, emblematic buildings and colorful mansions. Chiado: The trendiest neighborhood in Lisbon, a meeting point of artists, bohemians and avant-garde personalities. São Pedro de Alcântara viewpoint: This belvedere is known for its beautiful garden (on the lower floor). From here you have an excellent view over the Baixa district and the Tagus River. Bairro Alto: Lisbon’s bohemian heart and nightlife Mecca, a district dating from the 16th century. Rossio Square: Lisbon’s central square and the true heart of the city.